A leading Manufacturer & Exporter of Demistar Pad. 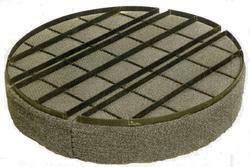 Our range of products include Demistar Pad such as Circular Demistar Pad, Demister Pad, Mist Eliminator Pad and Mist Demister Pad. Ideal for entertainment in pollution control unit and chemical industries. It is available in various sizes for meeting with the demands of a huge clientele. We are known for timely delivery of orders. Used as an entertainment eliminator. 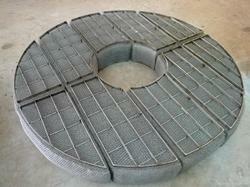 The product is effective in air pollution control and exceptionally eliminated toxic mist from gases. It is also used for reducing solvent losses in absorbers, to minimize product losses in kettles and in sealing gaskets made from knitted wire mesh. The pad is available in various sizes and shapes according to the applications. Used for entertainment procedures in pollution control plant and chemical industries for keeping the toxic particles from escaping into air or water vapor. It can be customized and supplied in bulk, owing to our expertise and dedication.